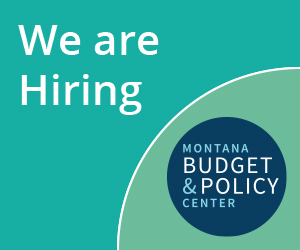 In 2015, Montana passed the bipartisan Health and Economic Livelihood Partnership (HELP) Act providing access to Medicaid for adults living on incomes below 138 percent of the federal poverty level (for a single individual with annual income below $16,750). Since then, more than 95,000 Montanans have gained access to health coverage and a wide range of preventative care services, such as vaccines, screenings, and dental exams. In addition to promoting physical health, Medicaid expansion also enables access to mental health and substance use disorder treatment services, for which the need is high in Montana. Behavioral health conditions (including both mental illness and substance use disorders) are among the most serious and challenging health problems in Montana. Substance use disorders are chronic medical illnesses that can be devastating for families and communities. They intensify demands on health care, public safety, and social services, as well as increase incarceration rates, if not addressed. The existence of both a mental health issue and a substance use disorder is referred to as a co-occurring disorder. In 2014, 39.1 percent of adults nationally with a substance use disorder also experienced a mental health condition. Living with undiagnosed, untreated, or undertreated co-occurring behavioral health disorders can lead to a higher likelihood of experiencing homelessness, incarceration, medical illnesses, suicide, or putting individuals at greater risk of dying prematurely from physical health problems. People with co-occurring disorders are best served through integrated treatment in which practitioners can address mental health and substance use disorders at the same time, an approach that improves long-term recovery and quality of life for patients and also lowers the cost of treatment. Community health assessments by Montana county health departments between 2012-2017 report that substance abuse is the most frequently listed high-priority health issue. Unfortunately, more than 90 percent of these Montanans are not receiving treatment for their alcohol and drug use disorders. In state fiscal year 2017, nearly 10,000 Montana Medicaid enrollees had a diagnosed substance use disorder. Suicide continues to be a major public health issue. Montana has been among the five states with the highest suicide rate in the nation for nearly 40 years. Nationally, whites have the highest rate of suicide, followed by American Indians. In Montana, this trend is reversed. Between 2012-2016, the American Indian suicide rate was 28.5 (per 100,000 people), compared to 23.1 for whites. The suicide rate is even higher among American Indian youth, young adults, and veterans., Behavioral health services can help all Montanans, including American Indians, address mental health needs and substance use disorders that, when untreated, lead to suicide. Medicaid Expansion is a critically important tool for Montana to more efficiently and effectively deliver and pay for behavioral health services. 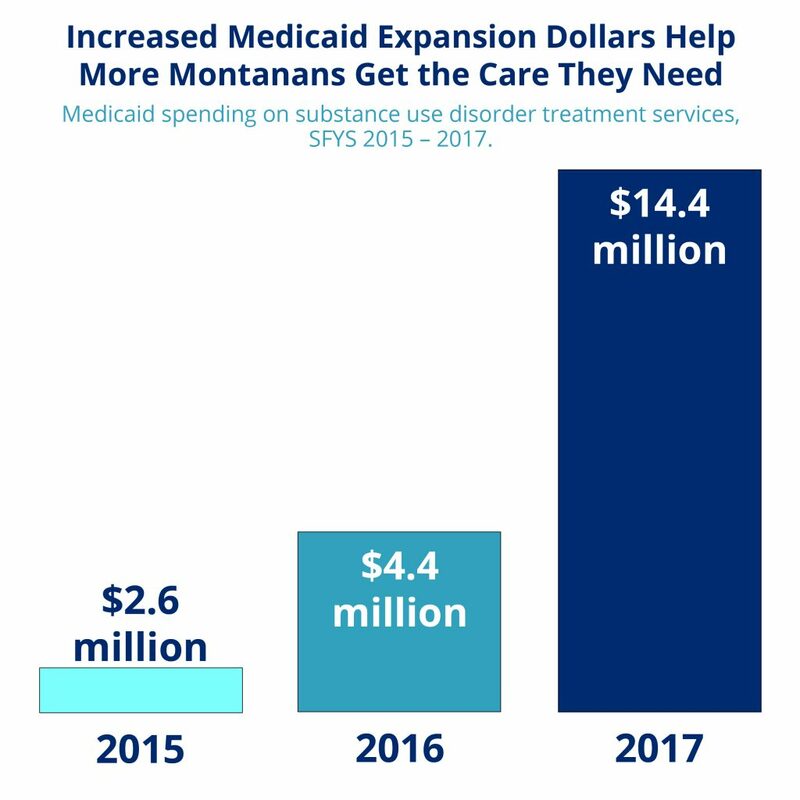 Prior to expansion, Montana Medicaid did not have a significant role in covering and paying for substance use disorder treatment. Now, for the first time, Medicaid provides a payment source for care for substance use disorders and mental illness that were previously covered only by the state General Fund and federal block grants. Medicaid spending on substance use disorders has increased five-fold from $2.6 million in 2015 to $14.4 million in 2017 as more people are able to get the care they need. To date, mental health and substance use disorder treatment services account for one in ten dollars spent on services for Medicaid expansion enrollees, highlighting just how crucial these services are for Montanans. In addition to substance use disorder treatment, Medicaid covers mental and physical health care services that help to enable successful recovery. Montana’s standard federal match for Medicaid is 65 percent. Montana receives an enhanced federal match for its Medicaid spending on expansion adults—100 percent in 2016, 95 percent in 2017, and then phasing down to 90 percent in 2020. If Montana’s Medicaid expansion continues beyond its current June 30, 2019, sunset date, the state will continue to receive a 90 percent enhanced federal match for Medicaid spending on expansion adults. As Medicaid covers a larger share of SUD treatment costs, federal Medicaid dollars replaced federal block grants and state dollars previously used to fund SUD services for uninsured Montanans. These funds are then “freed up” and may be reinvested in Medicaid, the SUD treatment and prevention system, and other priorities. Tragic and debilitating behavioral health disorders, such as major depression, schizophrenia, bi-polar disorder, substance use disorder, and panic disorders, affect the everyday lives of thousands of Montanans. Without access to health insurance or affordable services, individuals have few alternatives to seek support, recovery, and stability, and suffer as a result. Untreated serious mental illness has a significant impact on our overall economy. When an uninsured individual’s mental health turns into a crisis, providing emergency services puts a greater burden on limited local resources of police and fire departments, emergency rooms, and county jails. Nationwide, 70 percent of juveniles involved in the justice system suffer from mental health disorders. Among people with schizophrenia, 75 percent go on to develop a disability and fewer than 25 percent are gainfully employed, raising disability and unemployment costs. More than a quarter of U.S. hospital admissions and disability payments are for people with severe mental illness, which increases the overall cost of providing health care. Sixty percent of those with mental health disorders are not receiving mental health services, with the high cost of services as the major barrier to receiving care. Medicaid is an important source of health care coverage for American Indians in Montana. In 2009, Montana ranked first among states with the highest number of uninsured American Indians. Instead, a majority of American Indians receive health care through the Indian Health Service (IHS). IHS is not a health insurance program, however, and American Indians cannot receive health care outside of IHS, Tribal Health, or Urban Indian Health Clinic facilities without incurring a cost for services provided. The type and availability of services varies widely from one facility to the next. This, coupled with chronic, inadequate federal funding and a low occurrence of individuals with private insurance, has contributed to the staggering health disparities experienced by American Indians today. Medicaid and its recent expansion provide critical access to a broader array of services and providers than American Indians in Montana can access through the rationed IHS-funded health care system, helping them meet their physical and mental health needs. Additionally, if services are accessed through IHS or an approved care coordination agreement, the federal government will pay 100 percent of the billed cost with no fiscal impact to the state. Studies show that Medicaid expansion results in reductions in uncompensated care costs for hospitals, clinics, and other providers. Medicaid expansion also reduces the cost of traditional Medicaid, health care spending by the Department of Corrections, and spending on substance use disorders. Montana has saved money in the criminal justice system because significant numbers of adults in jails and prisons have behavioral health problems. Enrolling ex-inmates in Medicaid when they leave jail or prison can reduce recidivism by ensuring that they can get treatment for substance use disorders and mental illness. Overall, Medicaid expansion increases the capacity of behavioral health care programs and makes them more effective in providing treatment and other necessary services. Early access to health care services can have a dramatic impact on achieving long-term recovery and improved quality of life. Under the Affordable Care Act, Medicaid and private insurers must cover mental health and substance abuse care, under the “essential health benefits” package. Providing affordable access to health care services will reduce stigma, discrimination, and isolation that too many with mental health disorders experience. Furthermore, stability of Medicaid expansion funding would enable health centers to continue to provide Montana’s rural communities with additional mental health, substance use disorder, dental, and other high-demand services. reducing costs for state and local governments and state economies. Montana Legislative Fiscal Division, “Medicaid Monitoring Report and Montana HELP Act Medicaid Expansion Report,” Dec. 3, 2018, https://leg.mt.gov/content/Publications/fiscal/interim/Dec-2018/Medicaid%20monitoring_HELP_Dec_2018_V3.pdf. SAMHSA Center for Behavioral Health Statistics and Quality, “Behavioral Health Trends in the United States: Results from the 2014 National Survey on Drug Use and Health,” 2015, https://www.samhsa.gov/data/sites/default/files/NSDUH-FRR1-2014/NSDUH-FRR1-2014.pdf. National Alliance on Mental Illness, “Dual Diagnosis,” Aug. 2017, https://www.nami.org/Learn-More/Mental-Health-Conditions/Related-Conditions/Dual-Diagnosis. Montana Healthcare Foundation, “Community Health Assessments,” Apr. 2017, https://mthcf.org/2017/04/community-health-assessments/. Montana Healthcare Foundation, “Medicaid Expansion: How It Affects Montana’s State Budget, Economy, and Residents,” June 2018, https://mthcf.org/wp-content/uploads/2018/06/Manatt-MedEx_FINAL_6.1.18.pdf. Montana Department of Health and Human Services, “2016 Suicide Mortality Review Team Report,” 2016, https://www.sprc.org/sites/default/files/resource-program/2016%20Montana%20Suicide%20Mortality%20Review%20Report.pdf. Montana Department of Public Health and Human Services, “Montana 2016 Suicide Mortality Review Team Report,” 2016, http://www.sprc.org/sites/default/files/resource-program/2016%20Montana%20Suicide%20Mortality%20Review%20Report.pdf. Montana Department of Public Health and Human Services, “Suicide in Montana: Facts, Figures, and Formulas for Prevention,” Updated Aug. 2018, https://dphhs.mt.gov/Portals/85/suicideprevention/SuicideinMontana.pdf. Kauffman & Associates, Inc., “Montana Native Youth Suicide Reduction Strategic Plan - Updated for 2018,” January 2017, https://dphhs.mt.gov/Portals/85/suicideprevention/MontanaNativeYouthSuicideStrategicPlan.pdf. Montana Healthcare Foundation, “Medicaid Expansion: How It Affects Montana’s State Budget, Economy, and Residents,” June, 2018, https://mthcf.org/wp-content/uploads/2018/06/Manatt-MedEx_FINAL_6.1.18.pdf. Manatt Health, “Medicaid’s Role in the Delivery and Payment of Substance Use Disorder Services in Montana,” Mar. 2017. https://www.manatt.com/Insights/White-Papers/2017/Medicaids-Role-in-the-Delivery-and-Payment-of-Sub. Joel E. Miller, “Dashed Hopes; Broken Promises; More Despair: How the Lack of State Participation in the Medicaid Expansion Will Punish Americans with Mental Illness,” American Mental Health Counselors Association, Feb. 2014. http://www.fredla.org/wp-content/uploads/2016/01/AMHCA_DashedHopes_Report_2_21_14_final.pdf. Ed Fox, “Health Care Reform: Tracking Tribal, Federal, and State Implementation,” Kauffman and Associates, Inc., May 20, 2011, https://www.cms.gov/Outreach-and-Education/American-Indian-Alaska-Native/AIAN/Downloads/CMSHealthCareReform5202011.pdf. Indian Health Service, “Health Disparities” Fact Sheet. https://www.ihs.gov/newsroom/factsheets/disparities/, Accessed July 5, 2016. Jessica Schubel, “Coverage for American Indians and Alaska Natives at Risk Under Senate GOP Health Bill,” Center on Budget and Policy Priorities, July 12, 2017, https://www.cbpp.org/sites/default/files/atoms/files/7-12-17health.pdf. US DHHS, Centers for Medicare & Medicaid Services, “Indian Health and Medicaid,” https://www.medicaid.gov/federal-policy-guidance/downloads/sho022616.pdf, Accessed Nov. 7, 2018. Kaiser Family Foundation, “Implications of the ACA Medicaid Expansion: A Look at the Data and Evidence,” May 23, 2018, https://www.kff.org/medicaid/issue-brief/implications-of-the-aca-medicaid-expansion-a-look-at-the-data-and-evidence/. Montana Public Radio, “Montana’s Medicaid Expansion Saved Corrections $7.6 Million Last Year,” Sept. 27, 2017, http://www.mtpr.org/post/montanas-medicaid-expansion-saved-corrections-76-million-last-year. Center on Budget and Policy Priorities, “Medicaid Expansion Can Help Reduce Behavioral Health Problems,” Mar. 29, 2016, https://www.cbpp.org/blog/medicaid-expansion-can-help-reduce-behavioral-health-problems.